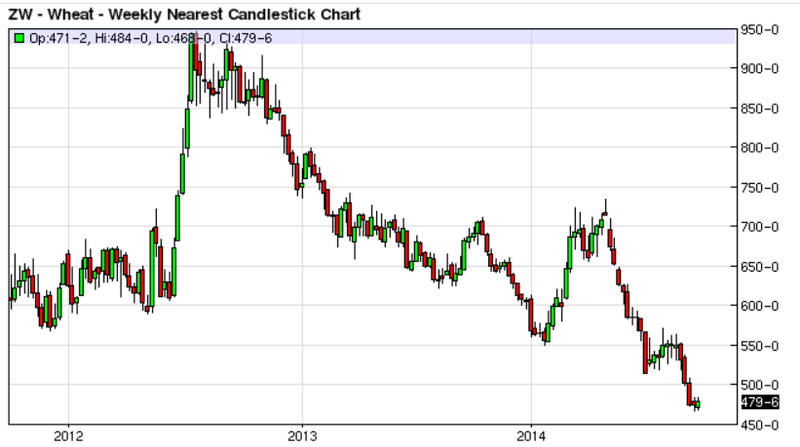 Mish's Global Economic Trend Analysis: Argentine Central Bank Chief Quits in Currency Dispute; Hyperinflation On the Way? Argentine Central Bank Chief Quits in Currency Dispute; Hyperinflation On the Way? On Tuesday evening, Argentine President Cristina Fernández accused Juan Carlos Fábrega, head of Argentina’s central bank, of "provoking a devaluation of the peso". In response Head of Argentine Central Bank Quits. Without naming Mr Fábrega directly, Ms Fernández accused the central bank during a nationwide address on Tuesday night of failing to control “manoeuvres” by banks and brokers to provoke a devaluation of the peso, and suggested that “privileged information” had been leaked. After continual clashes over economic policy with Argentina’s economy minister Axel Kicillof, there are fears that Mr Fábrega’s departure may clear the way for greater government control over the central bank. “Kicillof has increased his power, he will have a bigger say on monetary issues and we should expect an acceleration in the pace of the worsening of financial conditions,” said Miguel Kiguel, who runs the EconViews consultancy. There was a sharp sell-off in the benchmark Merval stock index after Mr Fábrega’s departure was announced. But Luis Secco, an economist, argues that the central bank has been “absolutely subordinated” to the executive’s decisions “for a long time”. Mr Fábrega leaves the central bank as annual inflation has climbed to around 40 per cent, and presided over huge monetary emission to finance a growing fiscal deficit, with negative real interest rates of about 20 per cent. Inquiring minds may be seeking proof the central bank has been "absolutely subordinated for a long time". Here's a chart that shows just that. 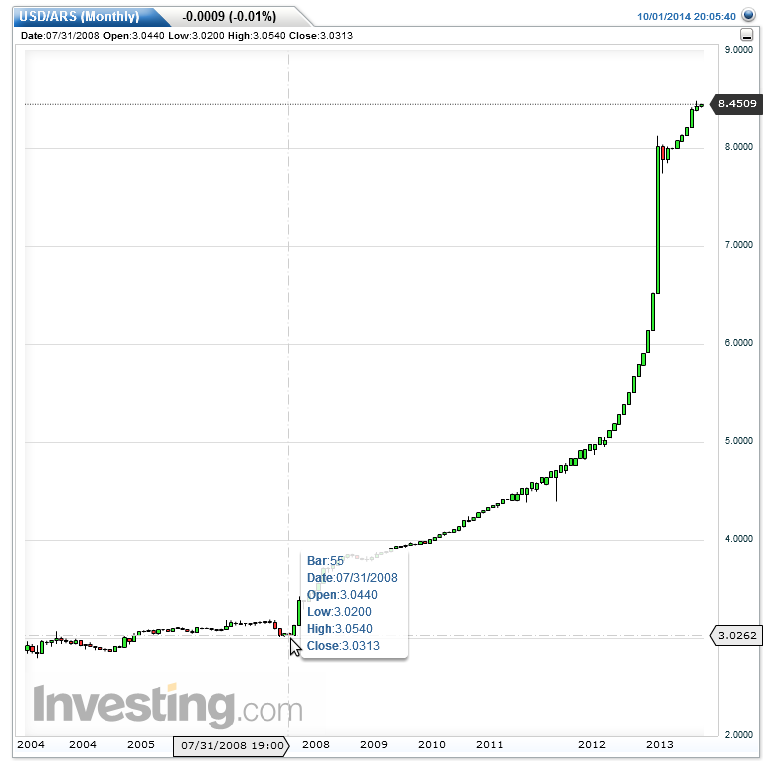 On July 31, 2008, the peso had been relatively stable an traded at 3.03 pesos to the US dollar. Today the peso trades at 8.45 to the US dollar. That's a decline of 64%. Does a 64% decline constitute hyperinflation? No not quite. Hyperinflation is generally defined as a complete collapse in currency. Nonetheless, such a decline does constitute severe inflation, especially since the decline has gone increasingly hyperbolic in the past two years. The black market exchange rate is about 14 pesos to the dollar. That's a decline of 78%. And that is arguably hyperinflation territory depending on how fast that decline occurred. Here's a Black Market exchange rate chart form the Wall Street Journal as of the end of August. On September 5, the Wall Street Journal reported Argentina Moves to Limit Dollar Purchases. Argentina limited the number of people who can buy U.S. dollars on Friday, following record demand for greenbacks amid fears that a debt default and hard-currency shortages could lead to a second peso devaluation this year. Argentine taxpayers seeking to legally buy up to $2,000 a month are now required to have a monthly salary of at least 8,800 pesos ($1,046). The increase from the previous floor of 7,200 pesos comes amid growing concerns about the central bank's declining foreign-currency reserves. Argentines have bought almost $1.5 billion since the program was launched in January, when the government devalued the peso by about 20% in an ultimately successful bid to halt a run on the currency and reserves. In just the first four days of September, taxpayers bought $147 million, compared with $260 million for all of August. The dollar purchases speak volumes about where some Argentines think the exchange rate is headed because buyers pay a 20% tax on those transactions, which effectively means they are paying about 10.10 pesos for each greenback. The local Rofex futures market quotes the peso at 9.1650 to the dollar in December. Argentines have few reasons to hold pesos. Benchmark deposit rates are at 21%, while inflation is widely believed to be nearly 40%. A black-market exchange rate of around 14 pesos to the dollar makes the official exchange rate of 8.41 pesos look overvalued and hurts confidence in the currency. The government has been selling limited amounts of dollars to taxpayers to keep them from turning to an underground currency market that is feeding inflation and devaluation expectations. But the default has rekindled demand for U.S. currency, causing the black-market dollar rate to surge from 12.30 pesos in late July and leading people to buy more dollars from the government. AGRICULTURE ought to be Argentina’s strength. Instead, incessant intervention has turned it into a source of weakness. The government has meddled in wheat production since 2006 by raising export taxes and setting export quotas. This interference, defended by the government as “protecting the tables” of Argentine consumers, has simply discouraged farmers from planting the crop. The interventions show no sign of stopping. Last year’s unexpectedly poor wheat harvest caused the price of bread to double, prompting the government to suspend exports of the crop. Last month was the first December in 25 years that Argentina did not export any wheat. Wheat production in Argentina has plunged—from nearly 16m tonnes in 2005 to 8.2m tonnes in 2013. Not all the intervening years have been terrible, says Santiago del Solar, an Argentine agronomist and farmer. There were decent wheat harvests in 2008, 2011 and 2012, as high international prices incentivised farmers to plant wheat despite the unpredictability of government policy. But with export restrictions becoming tighter and tighter, Mr del Solar has slashed the area he plants with wheat. He expects other farmers will do the same. The retreat from wheat has devastated exports. According to the US Department of Agriculture, Argentina was the world’s fourth-largest exporter of wheat in 2006. By 2013, it had dropped to tenth place. Not only are exports in tons down, prices are down even more. Things do not look promising for Argentina. Governments taking over central banks is a strong indication of futher trouble. 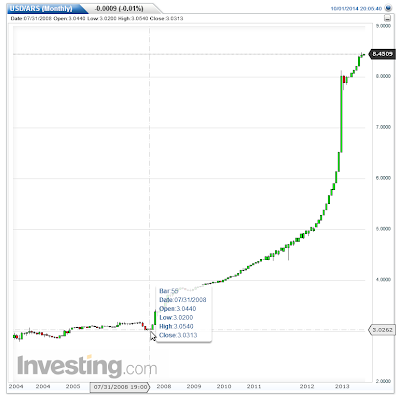 That Argentine citizens willingly pay a 20% tax to escape the peso is another sign. A fourth factor is falling commodity prices. 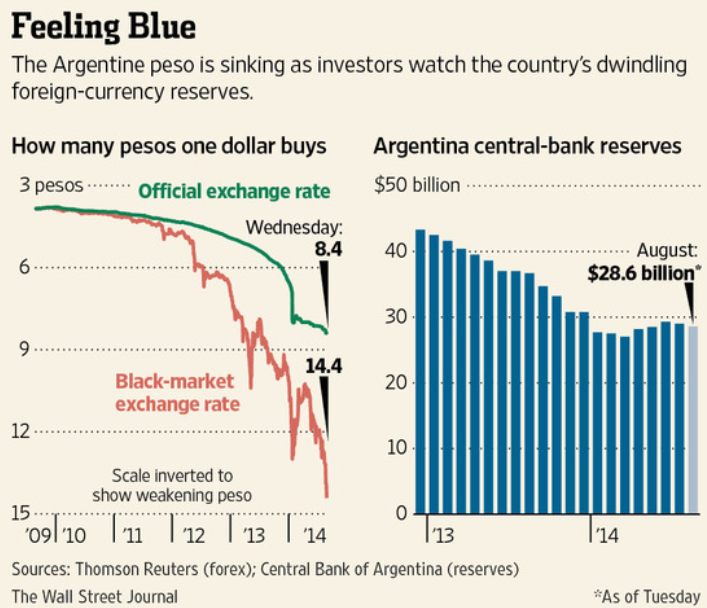 If Argentina uses up all of its foreign currency reserves, it's lights out for the Argentina peso.